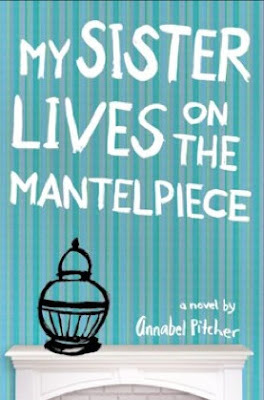 MY SISTER LIVES ON THE MANTELPIECE by Annabel Pitcher follows the story of Jamie Matthews, who was only five years old when his sister, Rose, was killed in a terrorist bombing in London. He doesn’t really remember her at all, but she’s still a part of his daily life. In fact, her presence dominates the family. Rose “lives” in an urn on the mantelpiece, because Jamie’s father can’t bring himself to let go of his little girl. When Jamie’s mother leaves them for a man she met in her grief support group, and his father moves the rest of the family to the English countryside for a new start, Jamie feels like he’s lost in the shuffle. His father is drunk more often than not, his mother never calls or writes, and his sister, Jas (Rose’s twin), spends most of her time with her new boyfriend. Jamie only has his new friend, Sunya, to rely on. But he has to keep the friendship a secret, because Sunya is a Muslim, and Jamie’s father hates all Muslims. He blames them all for the attack that killed his little girl. Pitcher tells a captivating story of love and loss and mourning. As Jamie’s friendship with Sunya grows, he struggles to understand the grief that’s tearing his family apart and the prejudice that poisons his father’s world view. This book is a great catalyst for opening conversations about death and loss as well as difficult discussions about hatred and prejudice. Excellent review - makes me want to go out and buy the book!